Elim Leytonstone are running a half day conference for women and girls (Aged 5 and above) from 1.00pm to 5.30pm on Saturday 7th July at Elim. This year, we will be exploring the theme ‘Who I Am.’ There are so many of us who do not know who we truly are. We too often compare ourselves to others, or define ourself in line with other people’s labels for us. ell, at the end of this conference you will gain so much insight into who you are, and have the tools and empowerment to live out the true you! Know you are beautiful, precious and powerful. Being part of this fun-packed day, we believe you will not leave the same way you came. This year will see the launch of GLAM Conference Magazine and GLAM Apparel. GLAM Apparel can be pre-ordered with ticket purchases. 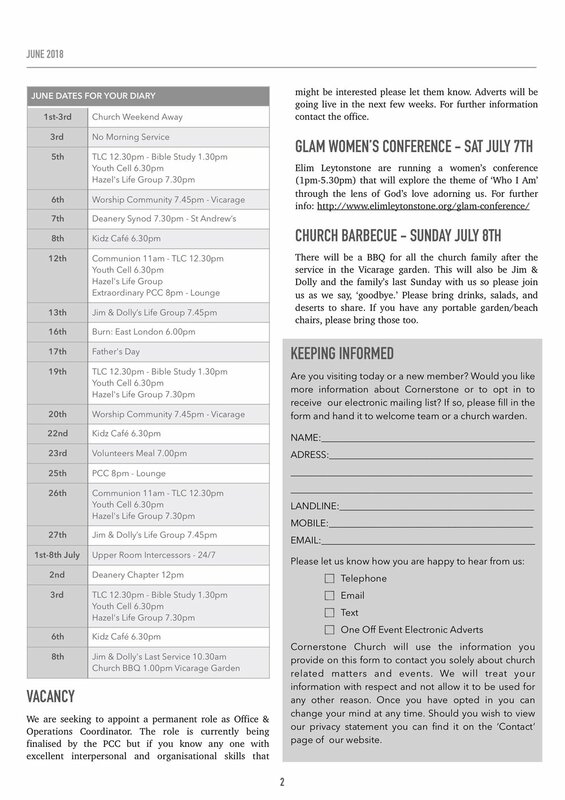 GLAM Conference Magazine will be distributed for free at the conference. For tickets, GLAM apparel, and further information, click here. Our bi-annual celebration and 'thank you' to all of our church volunteers is returning on 23rd June. The event is by invite only. Save the date if you are a regular volunteer. Invites will be coming your way shortly. This year, we will be celebrating Italian style! Upper Room Intercessors is a seven-day 24/7 residential prayer initiative running from Sunday 13th May to Sunday 20th May 2018 (Pentecost), at Cornerstone Church. It is our response to Thy Kingdom Come this year. It serves as a gathering of, and a clarion call to, all who have a heart and a passion for intercessory prayer. Though repentance, intercession, and heartfelt prayer the expressed aim of Upper Room Intercessors is to see a foundation laid across the UK for the coming weight of God's glory. The week will start and end with worship services on the 13th & 20th May and will include prayer walks around the borough on 14th & 15th May, a Holy Spirit Night hosted by Army Rising on Friday 18th May and the East London Burn on 19th May. The remainder of the week will be spent in prayer in an environment of worship as God leads. Other ministries both in London and around the UK are supporting the initiative in prayer. We also welcome prophetic artists, dancers, and those involved in other worship, warfare and intercessory ministries. Attendees are welcome to the entire event (with the option to sleep in the church), or to come and go as they please. This is a ticketed event although tickets are free. They can be purchased here. Join us for our Waltham Forest Citizens’ Assembly on Wednesday 25 April in Walthamstow Village (Waltham Forest Islamic Association Community Hall, 119-121 Grove Road, E17 9BU) as we ask politicians seeking to be Leader of Waltham Forest Council to work with us on our People’s Agenda to reduce youth crime and build more genuinely affordable housing for local people. We’re looking to get 500 members to the assembly from our 10 member organisations which represent over 15,000 people in Waltham Forest! Join us for what will be an energetic, exciting People’s Assembly on 25 April, 18:45 for 19:00 start (sharp! ), as we work together for the Common Good in our borough. If you've not yet been to a Citizens' assembly, come and see what it's all about - we need your participation to make our community safer, healthier, and a place where everyone can thrive. Book your free ticket/s by clicking here. Welcome to Crowns Of Fire Ministries' one day Breakthrough Conference. We want to continue building and pouring into the lives of women to help them step into their God given destinies. God is knocking on the hearts of women all over the world to reconnected to his heart. Your destiny, the reason you were created, the mandate for your life. This is available to you, its yours. The Lord is looking for those that would say yes. Come as you are and encounter God's heart for you. If you want to expereince the heartbeat of God again, reconnect to him and find out His purpose for your life, then Crowns of Fire Ministries invite you to Breakthrough: Resurrection, Reconnection, Redirection. Come and get challenged, impacted, healed, restored and receive the breakthrough you have been waiting for. Its breakthrough time. Don't miss out! Hosted by Leyton Churches Together, both concerts will be held at Elim Pentecostal Church on Hainault Road, Leytonstone, E11. The nearest stations are Leytonstone and Leyton Midland Road. Cornerstone Pre-School are providing an internship for a German student called Leah who is looking for a host home from 16th March to 8th June 2018. She is willing to help in the home and provide babysitting. She is also able to make a financial contribution towards her stay. Please let the office know if you would be happy to offer her a space in you home. It is wonderful how many of you are able to join us as we celebrate Howards's life on Monday. Dress code - Whenever I asked Howard what I should wear to an event he would say "Whatever you are comfy in" so that is the dress code for his Celebration. If you want to wear bright colours feel free to do so, if you prefer to wear black please do. Formal or casual it is entirely up to you. 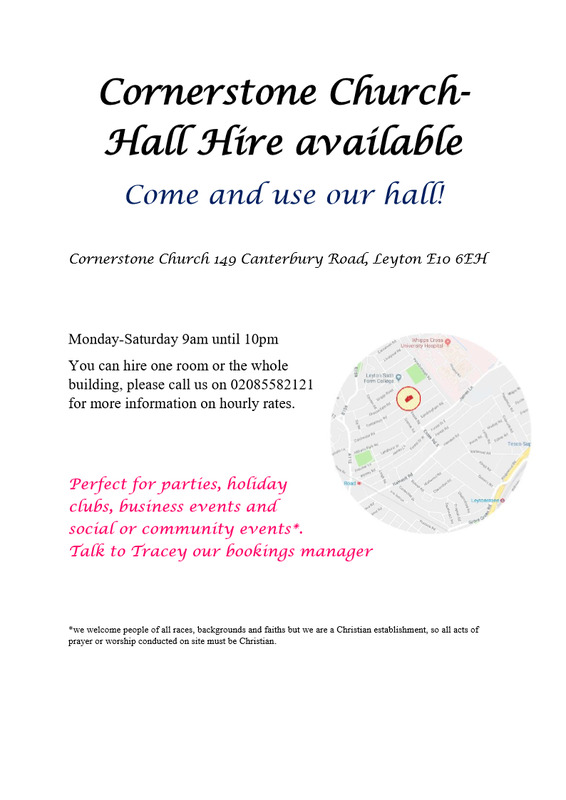 The church is 5-7 minutes walk from Leytonstone Underground Station. Parking - We are expecting over 350 people so parking will be in short supply. The streets around the church are mainly CPZ but the police have lifted parking restrictions on the following roads Fairlop Road and Hainault Road. We also have parking vouchers for the Abbots Park/Midland Road area (AM) which is about 5 mins walk from the station (these will be available from Cheryl prior to Monday or on the day from the reception desk at Elim Church. Flowers - we will just be having flowers from the immediate family. However we will be having a collection on the day that will be shared between four charities that Howard regularly supported. Cakes - Many of you have asked if you can bring anything. We have caterers who will be providing a range of hot food but if you are a baker and would like to bake a cake that would be great. Viewing - Should you wish to see Howard you can contact the Funeral home to arrange a visit on Friday 19th January. Finally we are expecting a lot of people so to be sure of a seat I would recommend that you arrive as early as possible. This Summer, from Saturday 1st July until Thursday 31st August, we as a church are encouraging everyone to read the book of Acts. Over the summer period we will be holding family services with a focus on characters from the book of Acts. We have divided up the book of Acts into daily readings averaging 12 verses a day. We have purposefully used smaller readings so that everyone can join in no matter how busy. Even if a whole week of readings is missed, catching up will be a matter of 2 or 3 chapters. During this period, we are encouraging you to share with each other what you got from the readings. you can do this using the app itself by adding your own 'community comments' or you can share when you meet people from church during the week, at life group, or at church itself. You can also make use of the church Facebook profile and have discussion with other members there. To join in with the reading plan you can follow the readings below, you can pick up the yellow plan at church and check off each reading, you can find the readings in the Cornerstone Weekly, or you can download the Faithlife Study Bible app, sign up to the Acts reading group, and follow along with the app. Instructions on how to do this are below. Today is Ascension day in the Church of England calendar, the day we mark Jesus' ascension to heaven after his resurrection from the dead. It marks the beginning of Thy Kingdom Come, the global prayer event. Thy Kingdom Come runs until Pentecost Sunday (4th June) and each day is marked by a call to prayer utilising a specific theme. We will post two items on our website blog each day to help us engage in prayer. The first is a video from a different leader in the global church. The second will contain a daily prayer guide from the World Prayer Centre to help us pray using the themes of Thy Kingdom Come. Due to the arrival of two beautiful girls in the lives of our Burn directors, the East London Burn is postponed until further notice. WE are sorry for this inconvenience and hope to be able to re-open it shortly. From Thursday 25th May (Ascension day) until Sunday 4th June (Pentecost) we will be joining with the global wave of prayer, Thy Kingdom Come, an initiative of the Archbishops of Canterbury and York. The aim is to pray that people in our City, Country, and around the world, will come to know Jesus as their saviour. During this time we will be joining forces with both Gateway Community Church and Elim Pentecostal Church (Leyton Churches Together) and holding joint events, individual events, and a combined 24/7 prayer rota from Sunday 28th May until Sunday 4th June (sign up here) with the aim of ensuring every single hour is covered in prayer by someone from our three churches. We are also hoping to open our prayer room from 9am-4pm during the week. The week of prayer will begin on Sunday 28th May with a 'Leyton Churches Together Thy Kingdom Come Prayer Launch' at Elim church at 6.30pm. It will end one week later with a 'Leyton Churches Together Thy Kingdom Come Celebration,' again at Elim, at 6.30pm. See some of the videos below to get inspiration. Do you want to #Pledge2Pray? You can do so on the Thy Kingdom Come website where there is also plenty of further information. Need help to pray? Great ideas can be found here. Further videos can be found on the Thy Kingdom Come Vimeo Channel here. As a Parish, we’re excited to be offering free training with Citizens UK on Wednesday, 3rd May, from 7-9.15 pm at St Mary’s RC Primary School in Chingford. At the Listening Training, we’ll learn more about key aspects of Community Organising, including how to have short and effective relational meetings (one-to-one conversations), how to host house meetings and more. As part of strengthening our alliance in Waltham Forest, we’re hoping to have hundreds of conversations with our neighbours in 2017 about what matters most to them and what they are concerned about; from these conversations, we will then build a manifesto to present to politicians before the 2018 local elections. Do join us on 3rd May – we’d love to have you!